The sheer number of buttons that greeted me on that first drive was also a bit overwhelming; I thought I might need pilot training just to get it home. I was sorely disappointed to find that not one of the switches inside was capable of brewing my morning latte. 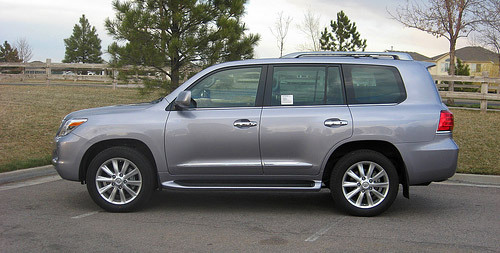 Once the initial aesthetic command and control shock wore off, I came to enjoy almost everything about the Lexus LX 570. Things I’ll miss most are the climate-controlled seats, front and side-view cameras and the automatic-folding third-row seats. The heated and cooled seats came in handy when we had 80-degree weather one day and a spring snowstorm the next. The front-mounted camera took a little getting used to, but it made me feel quite spy-like when I was able to easily park this rig in a tiny spot at the mall. I enjoy these functional kinds of reviews, with very little to no focus on engine-size/0-60 times, they’re a nice foil to the more technical breakdowns. The slice-of-life perspective is refreshing.